As you know I'm really getting into this time lapse photography at the moment and there is a super moon this evening which I'm hoping to capture. Preparation is everything, isn't it? After studying The Photographers Ephemeris, (a must have application for any serious landscape photographer) I wanted to find the best locations around Brisbane without going into the CBD to ensure that I have an interesting foreground for this event. Yesterday I had planned to visit at least two of these locations to determine which would present the best foreground options, which I eventually did however I did learn a valuable lesson. One should be prepared for the unexpected even when scouting locations in preparation for a planned shoot. 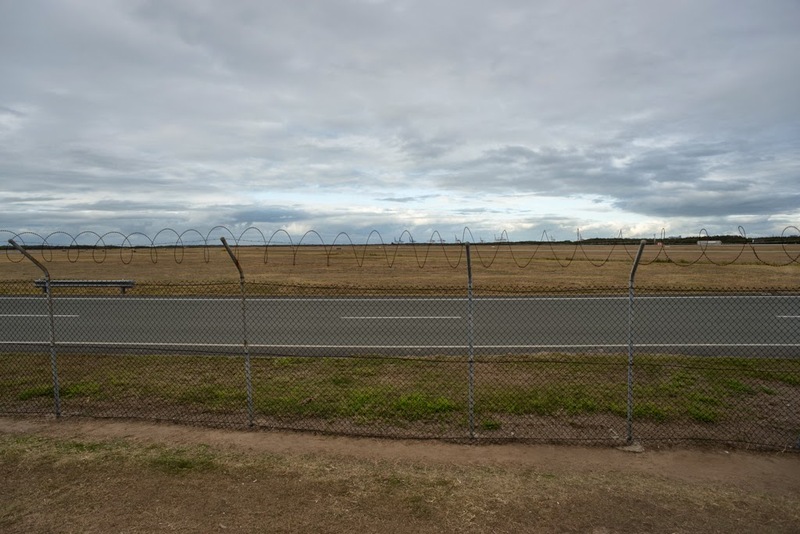 The two locations I had in mind were the Airport, and Colmslie Recreation Reserve. The first placing me 5km (as the crow flies) from the Port of Brisbane making the the overhead container crane's an ideal foreground silhouette for a 400mm shot with the Sony a99 while I capture the time lapse images on the Sony a65 with a 20mm lens. The second would place me only 1.7km from the Gateway Bridge but on the upside, the moon will rise dead centre of the Bridge and providing the evening is cloudless I should be able to get some truly great captures. On arrival at the airport location I had difficulty finding a parking as this is a popular location for plane watchers but the following is a quick snap with a 20mm lens for the time lapse. Airport view with cranes dead centre on the horizon. While 5km is fine for the 70-400mm lens it's not so interesting for the 20mm but it would probably come down to which shots I want to give priority so I set off to check the second location. 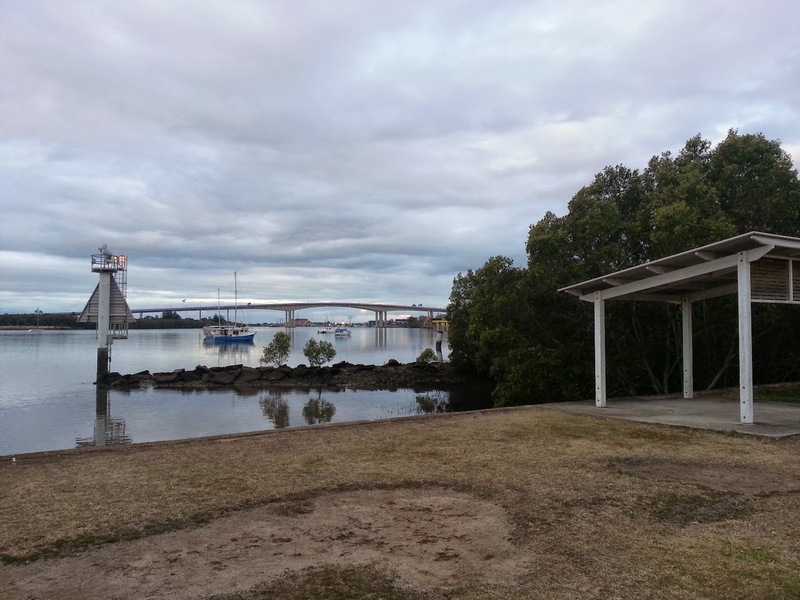 Gateway Bridge from Colmslie Recreation Reserve. Definitely more interesting for both lenses and I shot this with my phone as I noticed a rather nice sunset opportunity developing in the opposite direction so I set-up for an impromptu time lapse shoot. I figured that I had about 30 minutes of good shooting (10 minutes to first colour and perhaps an additional 20 minutes to second colour) so I set-up for 3 second intervals. Now before I show you what I did capture, beautiful as it is you will be left disappointed because I committed a cardinal sin, I failed to check my Battery or my SD card (Battery was at 19% and SD card had 40% capacity remaining) The card ran out first by the way and yes I had spares of both and I did the frantic changeover.... what's that expression "more speed less haste" ... you guessed it the opportunity was lost, a 30 second hole in a time lapse of 3 second intervals stands out. So as you can see a beautiful unexpected opportunity was lost because I was not prepared for the unexpected. I should have checked my battery before leaving the house and I should have formatted the SD card the moment I placed it in the camera. Lesson learned.